Mechanical transmission, which connects a motor inside the ship to the outboard unit by gearing. The motor may be diesel or diesel-electric. Depending on the shaft arrangement, mechanical azimuth thrusters are divided into L-drive and Z-drive. An L-drive thruster has a vertical input shaft and a horizontal output shaft with one right-angle gear. A Z-drive thruster has a horizontal input shaft, a vertical shaft in the rotating column and a horizontal output shaft, with two right-angle gears. Electrical transmission, more commonly called pods, where an electric motor is fitted in the pod itself, connected directly to the propeller without gears. The electricity is produced by an onboard engine, usually diesel or gas turbine. Invented in 1955 by Friedrich W. Pleuger and Friedrich Busmann (Pleuger Unterwasserpumpen GmbH), ABB Group's Azipod was the first product using this technology. 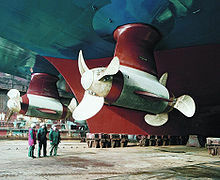 The most powerful podded thrusters in use are the four 21.5 MW Rolls-Royce Mermaid units fitted to Queen Mary 2. Mechanical azimuth thrusters can be fixed installed, retractable or underwater-mountable. They may have fixed pitch propellers or controllable pitch propellers. Fixed installed thrusters are used for tugboats, ferries and supply-boats. Retractable thrusters are used as auxiliary propulsion for dynamically positioned vessels and take-home propulsion for military vessels. Underwater-mountable thrusters are used as dynamic positioning propulsion for very large vessels such as semi-submersible drilling rigs and drillships. The BPC Dixmude manoeuvering in Jounieh bay; the wake at the stern is perpendicular to the ship, indicating the use of her azimuth thrusters. Primary advantages are maneuverability, electrical efficiency, better use of ship space, and lower maintenance costs. Ships with azimuth thrusters do not need tugboats to dock, though they may still require tugs to maneuver in difficult places. English inventor Francis Ronalds described what he called a “Propelling Rudder” in 1859 that combined the propulsion and steering mechanisms of a boat in a single apparatus. The propeller was placed in a frame having an outer profile similar to a rudder and attached to a vertical shaft that allowed the device to rotate in plane while spin was transmitted to the propeller. The modern azimuth thruster using the Z-drive transmission was invented in 1950 by Joseph Becker, the founder of Schottel in Germany, and marketed as the Ruderpropeller. Becker was awarded the 2004 Elmer A. Sperry Award for the invention. This kind of propulsion was first patented in 1955 by Pleuger. In the late 1980s, ABB Group developed the Azipod thruster with the motor located in the pod itself. ^ "Presentation of The Elmer A. Sperry Award for 2004" (PDF). Sperryaward.org. Retrieved 24 November 2014. ^ "Patent US2714866 - Device for propelling a ship". Google.com. Retrieved 24 November 2014. Wikimedia Commons has media related to Azimuth thrusters.